We are excited about your interest in WVSU. Our dedicated staff is eager to assist you with the admission process. Prospective students seeking admission to bachelor's degree programs should contact the Office of Admissions, Room 124 Ferrell Hall, West Virginia State University, Institute WV 25112-1000. Students seeking readmission should contact the Office of the Registrar, Room 128, Ferrell Hall. Admissions counselors will provide forms and answer questions about the admissions process and degree programs. The Office of Admissions can share dates when the ACT examination is administered on campus. Those seeking admission have typically completed the following college preparatory curriculum in high school: four units of basic English (grammar, composition, and literature); three units of laboratory science (biology, chemistry, physics, and other theory-based courses with a strong laboratory science orientation); four units of mathematics (three units must be Algebra I and higher); three units of social studies, including U.S. History; one unit of art; and two units of foreign language (two units of the same foreign language). Students planning to enter engineering-related or science programs are encouraged to have units of advanced algebra and trigonometry. Students who are deficient in one or more areas may be denied admission until such time as deficiencies are removed. Students found to be deficient in basic skills on the basis of ACT or proficiency test scores may be denied admission. Admission to WVSU does not necessarily mean admission to a particular degree. 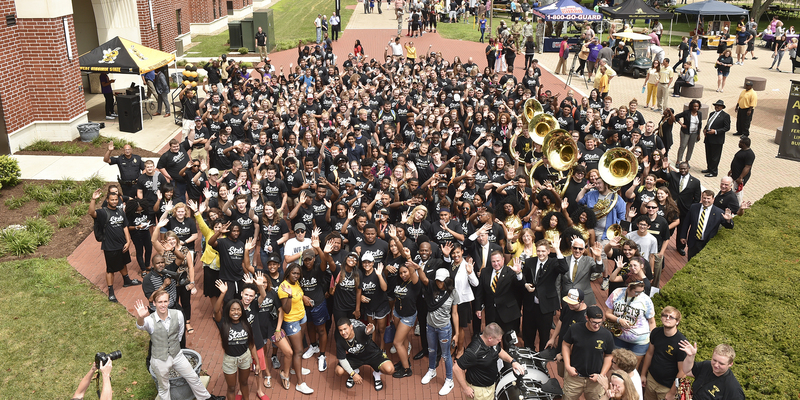 Students seeking admission to programs which have limited enrollment or admissions requirements must apply for admission to the individual program as well as for general admission to WVSU. Students may consult the requirements for bachelor's degree programs on this website by visiting the area of study they are interested in to determine if application must be made separately for admission to the program. It is suggested that prospective students initiate the application for admission process at least six months prior to the start of the semester in which they wish to begin classes. Admission Office Student Assistants and Tour Guides are here to help! Still have questions? If you can't find the answers to the questions you need here, please contact us at (304) 766-3000. If you have specific questions for admissions, we are available Monday through Friday 8:30 a.m.-5:00 p.m.